irupaththu nAlAyiram – (vykyAnam for it is) – irupaththu nAlAyirappadi (24,000). 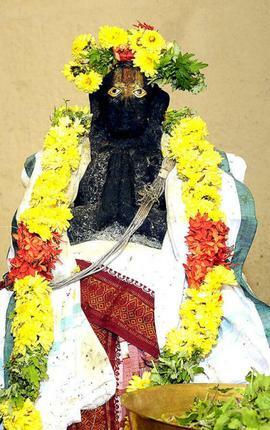 He (maNavALa mAmunigaL) is divining that, after that, based on nampiLLai’s order, periyavAchchAn piLLai divined a vyAkyAnam that is three times bigger than the one said in previous pAsuram (onbadhinAyirappadi vyAkyAnam of nanjeeyar). 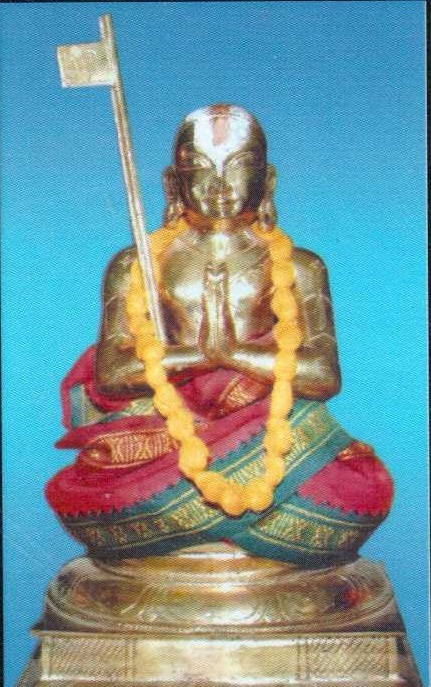 adhanAl – based on the command of the AchAryan – by this it distinguishes him from naduvil thiruveedhip piLLai bhattar, and vadakkuth thiruveedhip piLLai who wrote vyAkyAams on their own accord (after listening to kAlakshEpams of nampiLLai). adhanAl inbA varu paththi mARan maRaip poruLai – If what is desired to be done very much is decreed to be done, then one would rush for it. For thiruvAimozhi too which is ‘pAlOdu amudhanna Ayiram [thiruvAimozhi 8.6.11]’ (being most enjoyable like the mix of milk and nectar/food), such a decree was made for doing vyAkyAnam. That is why he authored vyAkyAnam for thiruvAimozhi that was created by the devotion instigated by emperumAn (that is, inbA varu paththi mARan maRaip poruLaich chonnadhu). 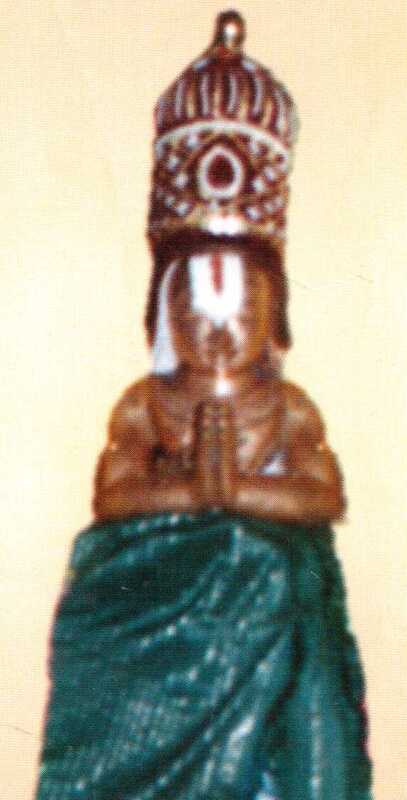 inbA varu paththi – The matter (emperumAn) to think about is sweet, as can be said as ‘susukham [srI bhagavath gIthA 9.2]’ (pleasant/sweet to follow in action), the devotion (bhakthi) is being of unlimited happiness, AzhvAr who is apt (prApthar) and respected/confidential (Apthar), by the force of overflowing devotion like a flooding river, divined thiruvAimozhi which is thamizh vEdham, and periyavAchchAn piLLai divined its meanings as a vyAkyAnam for it. 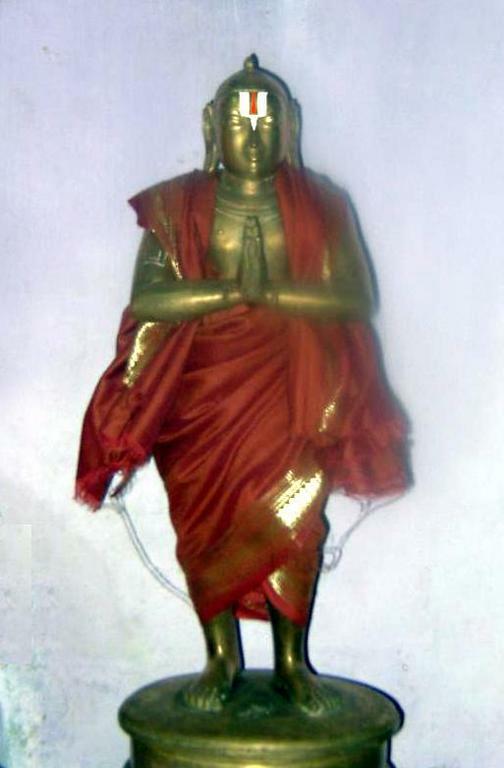 irupaththu nAlAyiram – is the meanings of thiruvAimozhi of paththi (devotion) mARan. Like saying ‘kAdhal kurugUrch chatakOpan [thiruvAimozhi 2.1.11]’ (having uncontrollable love that is nammAzhvAr of AzhvAr thirunagari), since this came due to ‘inbA varu paththi’ (grace through which the devotion came), it incarnated as ‘bhakthAmrutham [thiruvAimozhi thaniyan]’ (as nectar for devotees). In this way, the unbounded sweetness that is the meanings of mARan‘s thiruvAimozhi, is of twenty four thousand. As said in ‘chathurvimsathsahasrANi SlOkAnAm ukthavAn rushi: [SrI rAmAyaNam bAla kANdam – 4.2]’ (rushi divined it having twenty four thousand slOkas), the count of one that is best of ithihAsams, that is, SrI rAmAyaNam, is how periyavAchchAn piLLai divined his vyAkyAnam. 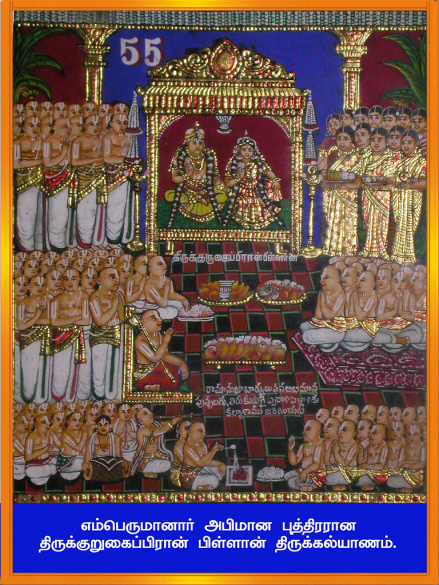 inbA varu paththi mARan maRaip poruLai – As said in ‘irAmAyaNam ennum paththi veLLAm [rAmAnusa nURRanthAdhi – 37]’ (~ flood of devotion that is rAmAyaNam), is how this (thiruvAimozhi) is also of flood of devotion. So its vyAkyAnam is also formed in the same way (of count). ‘SrI rAmAyaNam enRum thiruvAimozhi enRum iraNdu mahA prabandhangaL uNdu’ (there are two great prabandhams named SrI rAmAyaNam and thiruvAimozhi) – is how these two are said as equivalent isn’t it? This entry was posted in Other, upadhESa raththina mAlai and tagged 24000, 74, annan, erumbi, erumbiappa, kovil, mamunigal, manavala, nampillai, pasurams, periya, pillai, rathina, rathinamalai, raththina, raththinamalai, upadesa, upadhesa, vachan, vachchan on January 14, 2016 by raghuram.